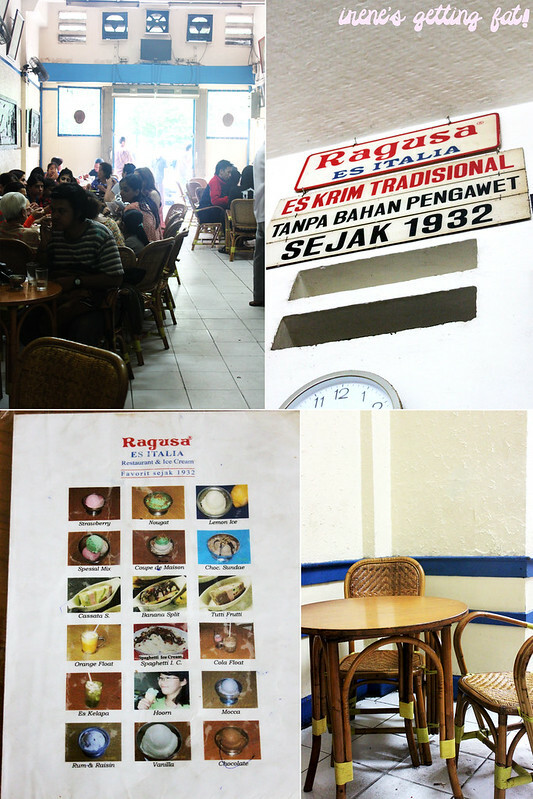 If Sydney has Messina, Jakarta has Ragusa. It's not as creative and modern, but it is certainly as popular and I always see patrons occupying most chairs inside. 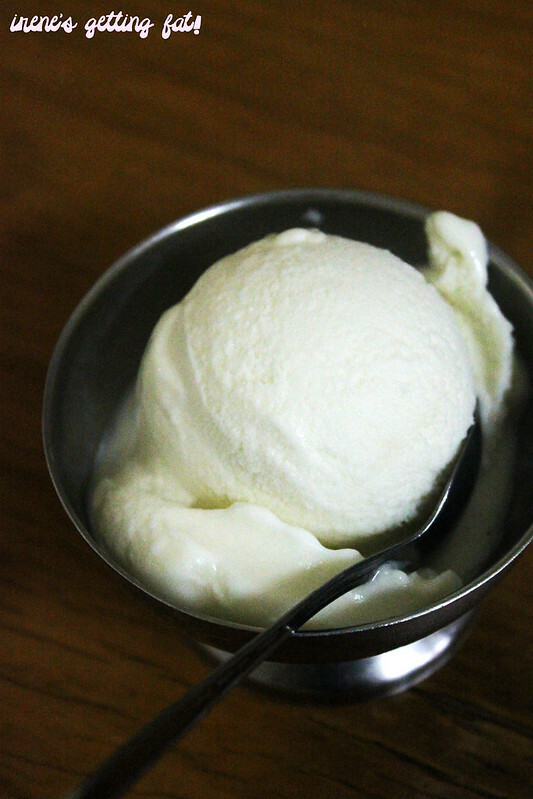 Ragusa has been serving traditional and preservative-free ice cream since 1932. The name is actually a district in Italy, whose people came to Indonesia in colonial era. The ice cream place has been retaining their vintage touches and ambiance by not replacing the old-school rattan furniture, antique wooden paintings, and olden pictures. Even the menu is still the same as the one I saw years ago. 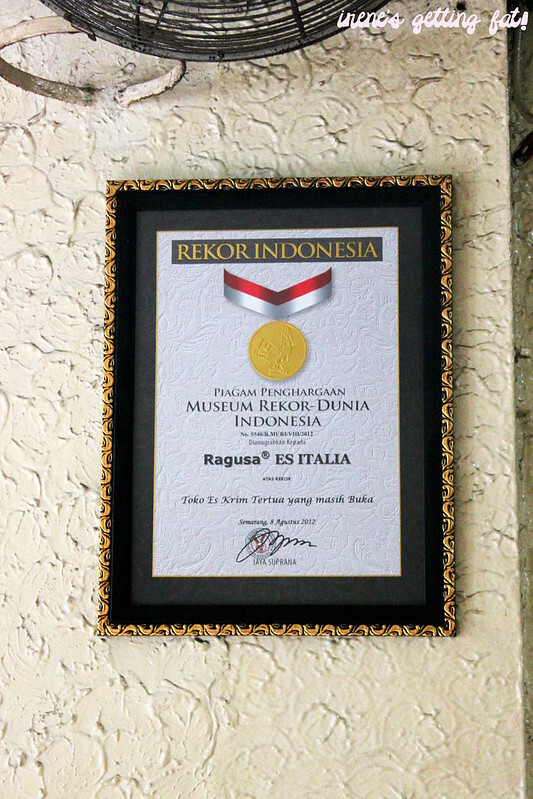 Among the aged decorations and signage, there is a newer certificate from Museum Rekor - Dunia Indonesia (World - Indonesian Record Museum) presented for them as the oldest ice cream place in Indonesia. Spaghetti ice cream is always the brother’s choice. It’s vanilla ice cream put into a mold, producing fat and long spaghetti-like shape. 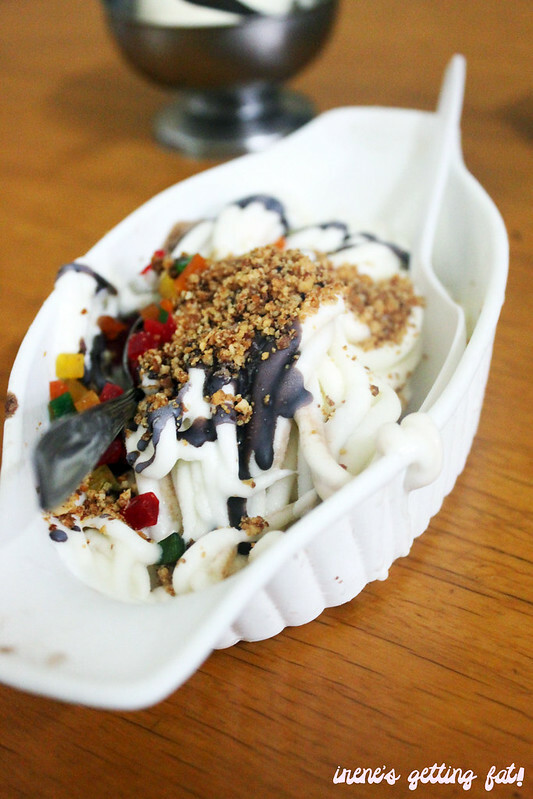 The colourful effect is added by the sukade (sugar-pickled fruit), melted chocolate (which freezes quickly), and crushed peanuts. It’s sugary but won’t make you wince, the ice cream has mini bits of ice flakes, but they aren’t disturbing the whole combination. 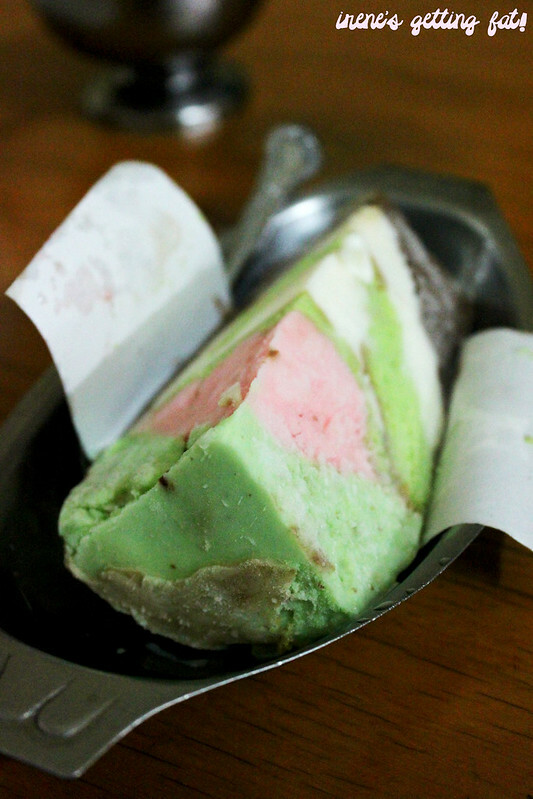 Cassata siciliana is an interesting one, a slice of multiple-flavoured ice cream combined with pandan sponge cake. The sponge cake gives a warmer touch, preventing brain freeze by the icy ice cream. Again, it has perfect level of sweetness. My favourite of the day is the durian ice cream, one scoop with intense smell and flavour of the king of the fruit. It’s much smoother than the other two, and every mouthful feels like an angel’s cuddle on your tongue. All of the three items that we tried melt rather quickly and icier than usual ice cream. Maybe it’s the non-preservative effect. And a good point for the service: they provide cold water to wash down the sugar. The place doesn’t offer any other thing apart from the ice cream, so customers are expected to order heavier food from the street food carts/vendors outside. 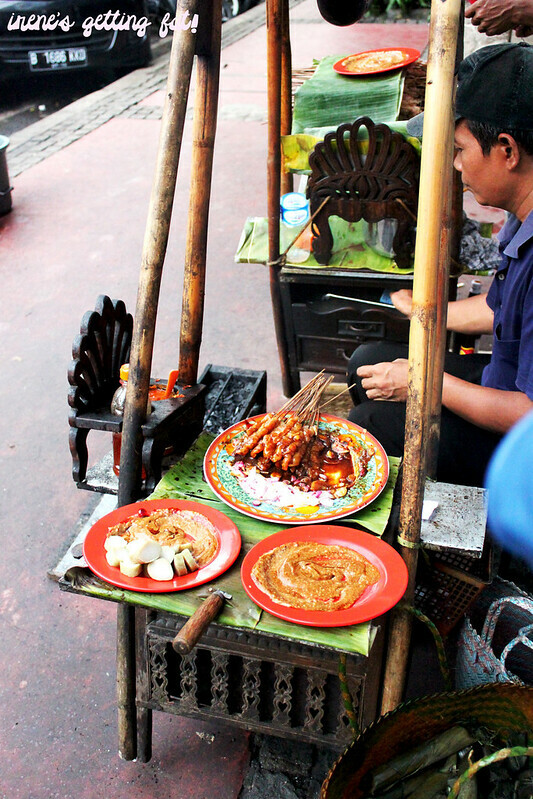 The asinan (sour Indonesian salad) and satay vendors are almost as famous as the ice cream itself. 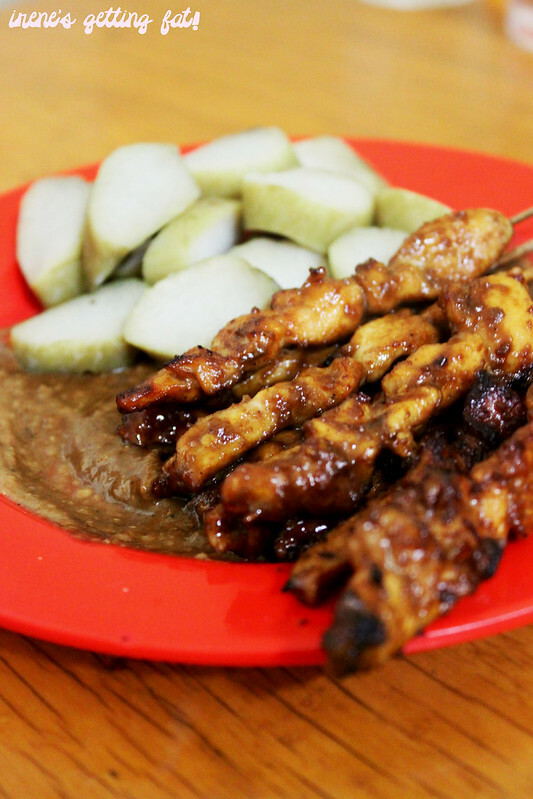 The famous ‘Ragusa chicken satay’ has tender and well-seasoned flesh, while the peanut sauce is thick and very tasty. That was one of few times that I don’t mind eating satay and the peanut sauce without any chilli. If you are looking for fancy ice cream or air-conditioned place, you won’t find them here. 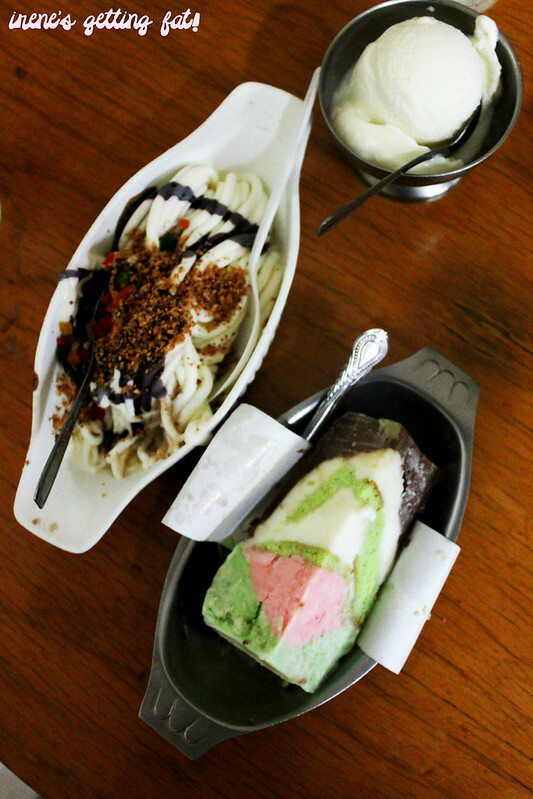 Nevertheless, I think the good old Ragusa is still attractive and I would recommend this place to tourists to get a try of Jakarta’s famous ice cream. Traditional food is always interesting for me, superb durian ice cream and other great options, price is relatively high but I think it’s worth it, service can do better with some improvements, ambiance is unique and nice. Trading hours: 9 a.m. - 10 p.m.
it's as good as the ice cream, yes? I do it too. skipping the nearest restaurants just bcause they're nearby home haha. You know, I've always had my suspicion that this is, in fact, not an ice cream vendor. 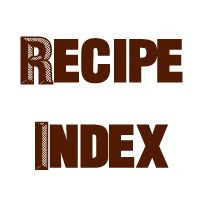 The texture and the way it melts ever so quickly in your mouth makes it more akin to sorbet than to ice cream, especially sticky italian ice cream that by all means does not melt quite easily in your mouth (rather... it kinda... sticks. If you know what I mean). True that. I am always curious about how they make their ice cream/sorbet though.